Prime Minister Sheikh Hasina on Sunday came down heavily on Dr Kamal Hossain for forging an alliance with BNP calling the combine a platform of killers and opportunists. “Dr Kamal claims to be an advocate of truthfulness, but has joined hands with Tareq Zia, who has no acceptability to the people of Bangladesh,” she said at a big public meeting organbized by Shibchar Upazila unit of Awami League in Kathalbari Ferryghat area here this afternoon. The prime minister arrived here this morning to inaugurate a number of projects in connection with Padma Bridge. The prime minister said Dr Kamal Hossain, who claims to be an internationally renowned lawyer, has forged an alliance with those who are responsible for killing people in arson attack, eating up orphans’ money, money laundering and for corruption. “Kamal Hossain speaks loud against corruption, terrorism and militancy. But he has formed alliance with two recognized militant and terror organizations- BNP and Jamaat, accepting Tareq Zia as his leader,” Sheikh Hasina said. “Was there no leader in BNP who is eligible to be the acting chairman of BNP?” asked Sheikh Hasina, also the president of Awami League, saying Tareq is convicted in a money laundering case, the ten truck arms smuggling case, the grenade attack case of August 2004 and now staying abroad as a fugitive. The prime minister said Sheikh Hasina said people of Bangladesh had given mandate to Awami League to form the government. In 2014, BNP and Jamaat killed hundreds of people in the name of movement to foil the election and they did the same in 2015 too. She said in last two elections people cast their votes for ‘boat’, election symbol of Awami League, as they could realize that the ‘boat’ means development, education and prosperity. Sheikh Hasina said Dr Kamal and his associates don’t see the country’s progress. Bangladesh’s annual growth has now reached 7.86 percent making it as role model of development. Bangladesh is progressing fast in every sector and has been recognized as a developing country by the UN. “The whole world sees Bangladesh’s development. But they cannot see it… their development means corruption, terrorism, money laundering,” the prime minister said adding that development of the country and people doesn’t carry any value for them. Sheikh Hasina, however, said she is not surprised with such behavior of Dr Kamal as both Kamal Hossain and Tareq Zia have made their black money white along with Khaleda Zia. Deputy Leader of the Jatiya Sangsad Syeda Sajeda Chowdhury, AL general secretary Obaidul Kader, party presidium members Matia Chowdhury and Faruq Khan, advisory council members Tofail Ahmed and Amir Hossain Amu, joint secretary Dr Dipu Moni, organizing secretary AFM Bahauddin Nasim and Noor-E-Alam Liton Chowdhury addressed the meeting, among others, while president of Shibchar Upazil unit Md Shamsuddin Khan was in the chair. Sheikh Hasina said Bangladesh is going ahead and its journey toward prosperity will continue. Awami League works for the welfare of the people, she said adding her party came to power with the pledge to light up every house with electricity. Now 93 percent people are getting electricity, she said adding no house in the country would remain without electricity. The prime minister said her government has been making stride to develop the country industrially alongside mechanization of agriculture. Farmers now can open a bank account with Taka 10 only and the sharecroppers can get bank loan. 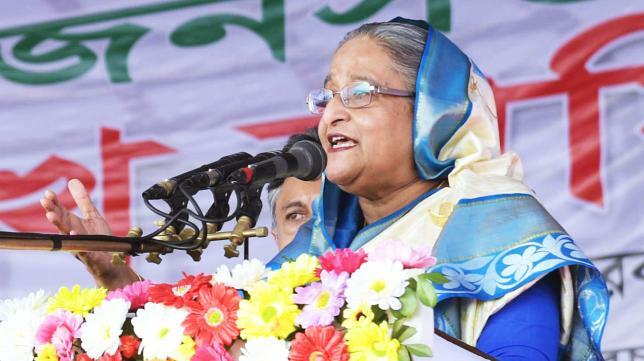 “Our children would enhance agricultural production through using modern agricultural technology,” she said adding that none would remain without food, shelter and healthcare services in Bangladesh. Urging people to cast their vote for ‘boat’, the prime minister said people of Bangladesh have established their right to speaking in their mother language by giving vote to Awami League. They have also won their freedom by giving vote to boat. Bangladesh is now a developing country as Awami League remained in power for the last ten years. Bangladesh could established its right to a huge maritime area and execute the land boundary agreement with India under the leadership of the Awami League government, she said. ‘Boat is the only means of emancipation of the people of Bangladesh,” Sheikh Hasina said urging people to cast their vote in favour of Awami League candidate to continue the development of Bangladesh. About the Padma Bridge, the prime minister said Awami League would complete the construction of the bridge if it comes to power again. At the same time, she added, a rail line would be constructed from Padma Bridge to Paira Port via Barisal.